A new study has found that those with hearing loss can lose brain tissue at a noticeably faster rate than those with normal hearing. Headed by Frank Lin, M.D., Ph.D., researchers from Johns Hopkins and the National Institute on Aging assessed information from the ongoing Baltimore Longitudinal Study of Aging to compare brain changes over time between adults with impaired hearing and those with normal hearing abilities. At the start of the study, all 126 participants received hearing evaluations, in which 75 had normal hearing and 51 had impaired hearing. Over 10 years, each participant underwent yearly MRIs to track any brain changes. 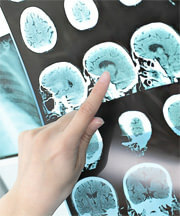 Lin and his team studied these MRIs and found that the 51 participants with impaired hearing had experienced “accelerated rates of brain atrophy” (muscle shrinkage)—losing an additional cubic centimeter of brain tissue each year—compared to those with normal hearing. The loss was found to be significant in the regions of the brain where sound and speech are processed. According to Lin, this concentrated shrinkage may be due to lack of stimulation, but these structures also play roles in one’s memory and sensory processing. In a future study, Lin and his team plan to examine whether treating hearing loss early with advanced devices, such as hearing aids, can reduce the risk of accelerated shrinkage as well as the associated health problems. A breakthrough study has revealed that the medial temporal lobe areas of the brain have an increase in activity while musical motifs are repeated.